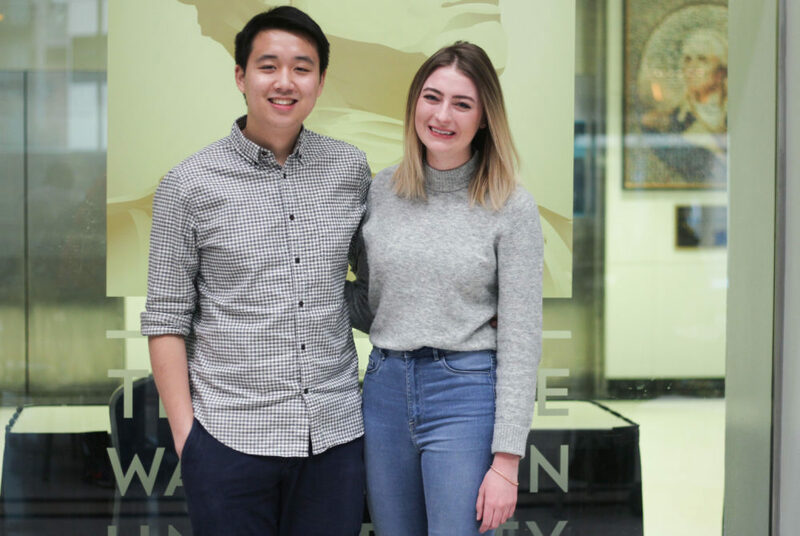 SA President Peak Sen Chua and Executive Vice President Sydney Nelson are adding new goals to their agenda this semester amid a renewed focus on student satisfaction. The Student Association’s top two leaders are adding new goals to their agenda this semester amid a renewed focus on student satisfaction. The SA’s president and executive vice president introduced a four-point agenda to University President Thomas LeBlanc during a meeting last month, asking for an overhaul of the Colonial Health Center, an emphasis on combating food insecurity, a University-wide syllabus bank and a new academic resource center. Reforms to student health and campus dining have been frequent targets of student government campaigns in recent years, but with University leaders zeroing in on the student experience as a top priority, SA leaders said it was an ideal time to address some of the most widely shared complaints about campus life. SA Executive Vice President Sydney Nelson said the issues have been long talked about within the SA and that several of the topics were priorities when their terms began last spring. She said the SA used the fall semester to garner student feedback and conduct research, culminating in a public push to improve those four areas this semester. The new priorities also update an agenda the leaders put forward in the spring – a combination of both students’ election platforms put together in the weeks after an election season rocked by allegations of stalking and harassment ended with both leaders assuming roles to which they hadn’t been elected. SA President Peak Sen Chua and Nelson said many of the initiatives will last into next academic year, but said the conversation between officials and student leaders should begin before their terms end later this spring. She declined to address the specifics of the new agenda, saying meetings would be held in the coming weeks. Chua said since Danielle Lico, the associate dean of students for student administrative services, began overseeing the CHC in September, she has “done a good job at streamlining the business processes,” but the center needs a permanent leader with health care management experience. Glenn Egelman, the health center’s first permanent director and a medical doctor, resigned unexpectedly in the fall, spurring student concerns about leadership in the often-criticized center. Student leaders also formed a health advisory council last fall to work with the CHC. Officials said after Egelman’s departure that they would take time to evaluate the center before searching for a new director. A formal search has not yet been launched. “We’re asking the University to articulate a long-term vision of what the Colonial Health Center is going to be from here on out because I think that students were really excited about Dr. Egelman and were really excited about his vision to create a health center that was more student-centered,” Chua said. He said the SA is also asking CHC officials to re-evaluate the quality of care the center offers, as well as the affordability and accessibility of the center as a whole. He said students have complained in the past about being misdiagnosed at the center or being unable to afford some services, like mental health sessions. Nelson said the SA will highlight food insecurity as a “serious and chronic problem” on GW’s campus this semester. To help combat the issue, she said SA leaders are calling on administrators to give more funding to student dining plans. Last year, officials gave all students $200 more to spend for the academic year amid affordability concerns, bringing the largest plan to $4,100 per academic year for freshmen. But one year after officials introduced a new “open” dining plan, students said running out of dining cash is still the norm. Nelson said the SA is also asking the University to enlarge its financial aid pool to cover the cost of expanding the dining plan so students don’t have to pay out of pocket. She added that the SA is also requesting officials reevaluate packages offered as part of GW’s meal deal initiative, which offers discounted meals at $6 for breakfast, $8 for lunch and $10 for dinner, at selected GWorld dining partners. Some of the deals are unhealthy or don’t provide enough of a discount to incentivize students to use them, Nelson said. Chua said the SA also wants to create an academic resource center, where several of the University’s academic offerings – like peer tutoring, writing help, Disability Support Services and career advising – can be combined into one office. Chua said the University lacks a central office to give aid to students who are struggling academically with the transition to college. Officials announced last month that the University would combine the Division of Student Affairs and the enrollment and retention office into one office focused on the student experience. But Chua said academic resources remain spread across various offices and departments, making them harder to access. Karisa Anand, the SA’s vice president of academic affairs, said last semester she helped conduct research about academic resource centers at other institutions and found that the vast majority of peer schools offer one academic center and that GW lags behind all of its peers in academic skill services. “I think students are very frustrated at this point because there are multiple resources that they need that they are not either having access to or it’s very hard to organize where everything is,” she said. Nelson said the SA is asking administrators to create a University-wide syllabus bank for students to access year-round. Currently, students can access a syllabus bank on Blackboard – the result of an SA push in 2015 – but Nelson said that bank is not regularly updated and only contains syllabi for a few hundred courses when the University offers thousands. She said the addition will help students before class registration so they can browse what a class will actually look like before they sign up. “We want to make sure students are empowered and not stressing out the morning of, trying to figure out what classes to take and what even do those classes entail,” she said.